Bride killed limo fire, A bride-to-be was among five women who died when a limousine burst into flames as it carried her and eight of her friends to her hen party. 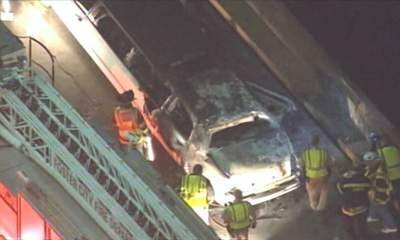 The car caught fire at around 10pm on Saturday on one of the busiest bridges across San Francisco Bay. All nine of the women were nurses. Five of them were trapped but four others managed to get out after the vehicle came to a halt on the San Mateo-Hayward Bridge. Rosita Guardiano, whose daughter survived, told the San Francisco Chronicle that the bride-to-be - named as 31-year-old Neriza Fojas - was due to be married next month. Investigators have not established what caused the fire, although a photo taken by a witness and broadcast on KTVU-TV showed flames shooting from the back. Aerial video shot after the incident showed about one-third of the back half of the limousine had been scorched. The Chronicle describes how the women could not get out of the rear doors, so they tried to squeeze through the small window into the driver's compartment. Emergency workers found the dead victims huddled under the opening. "This is one of the most horrific things I've seen in 21 years with this office," San Mateo County's medical examiner, Robert Foucrault, said. "Looking at it, they were on top of each other and doing what they could to get out." The driver of the white stretch limo, 46-year-old Orville Brown from San Jose, was the only person to escape unhurt. "Four people got out, as far as what was going on inside, I don’t know," California Highway Patrol officer Jeremy Lofstrom said. Investigators are appealing for witnesses to the incident. All five women were pronounced dead at the scene. Mrs Guardiano said her daughter, 42-year-old Mary Grace Guardiano from Alameda, was being treated for smoke inhalation. The three other women who escaped, Jasmine Desguia, 34, from San Jose; Nelia Arrellano, 36, from Oakland; and Amalia Loyola, 48, from San Leandro, were taken to hospital to be treated for smoke inhalation and burns.